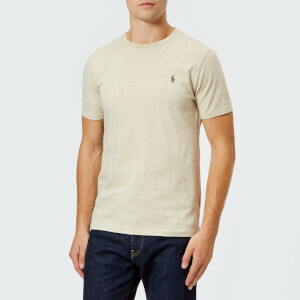 Green Polo Ralph Lauren polo shirt with the brand’s signature embroidered big pony logo on the chest, which is meticulously embroidered with a total of 10,800 stitches. Crafted from cotton mesh, the iconic design is cut for a slim fit and detailed with ‘3’ appliqué on the left sleeve in reference to the strongest player on a polo team. The classic polo shirt is finished with a ribbed polo collar and cuffs, a two-button placket and a tennis tail hem with side vents.